I’m sure you’ve been in suspense this entire time about whether I met Ina Garten and if she made me one of her fabulous friends up in the Hamptons. Have I left my life in DC behind to go from dazzling urbanite to scintillating suburbanite? Well the short answer is no and the long answer is noooooo. I did get to “meet” her, more or less, but getting to that point is a tale in the telling. I haven’t been to too many book signing events in my time, but between the atmosphere and the signing itself, this could easily turn one off of them. Not that I wasn’t elated to meet her, but after standing around for 2 hours in the rain, one could have hoped for a bit more. Now, when we left the office, it was just a cloudy day, rain was forecast for the evening, but nothing else. When we got out of the store, the bottom dropped out. We quickly walked around the shopping center to get in line and my co-worker went back to the car to get our umbrellas. And then came the waiting… We struck up conversations with others in line, I shared my umbrella with a very nice guy and as the line moved, we inched forward… and kept checking the time. I know that she’s popular, but I don’t think any of us expect to stand in line for nearly 2 hours, outside, in the rain, without much organization or information. Eventually Sur La Table employees brought us out plastic bags in which to hold our books and tried to give us a heads-up as best they could. It started to feel like an amusement park, “From this point there will be a 45 minute wait,” except there were no Fastpasses! I did my best to maintain a positive attitude, tweeting and sending photos, but at some point the phrase “I survived cancer for this? !” did go through my head. Finally after what seemed like hours–and actually was hours, we made it inside the store. The line still stretched around the interior of the place, but it still felt like progress… and then we saw the signing rules: no personalized autographs and no posing for photos. The guy I’d shared my umbrella with immediately said “Are you kidding me? !” and there was a four-letter word uttered by someone behind us in line. Now if I’d known these rules before paying full price for the book and getting in a 2-hour line…in the rain, I might have reconsidered it all, but that sign wasn’t near the books or the cash register. By the time we saw it, we felt so close that it seemed ok to stick it out, even if we were being shuffled past her as if we were on an assembly line. A few feet from the door to the room, an employee advised us how to arrange our books for an easier–read faster–signing, and then at the doorway another employee reminded us that she couldn’t pose for photographs, but that we could give our camera to an employee who’d take a picture of us while she signed our books. Still not the best arrangement, but I took a deep breath, worked on my best smile and convinced myself that if I was ever going to become one of her gays, now was the time. As mentioned, that didn’t happen, but she was very nice for all of the 45 or so seconds I got to “talk” to her. Thankfully I had two books for her to sign, so I got a little bit of extra time and I mean a “little bit” and then a security guard shuffled me along, barely giving me time to put my cameras away. And that was it, really. Aside from a few photos I snapped through the window or while waiting in line, it wasn’t exactly a great “foodie” experience. When compared to meeting Sara Moulton at Hill’s Kitchen, this one pales in comparison. 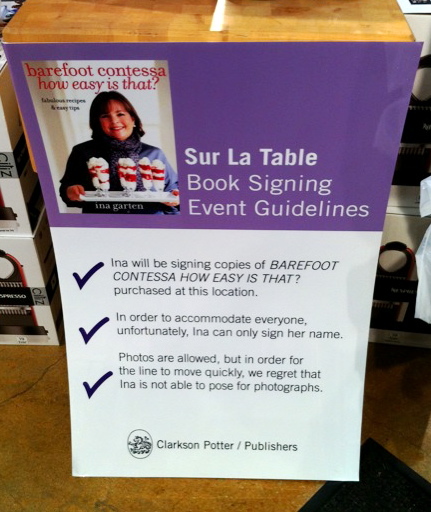 Admittedly, it was a smaller crowd and Sara scheduled a cooking demo and Q&A, and while I didn’t expect all that, I was hoping that I could at least get a “To: _____” in my book, not just her quickly scrawled autograph. Still, I did get to see one of my food idols, even if I couldn’t really say more than a sentence to her, so I suppose that counts for something. Next time, however, I will call ahead to find out if the store or publishing company has any rules or restrictions on the signing. Caveat emptor and all that, right? 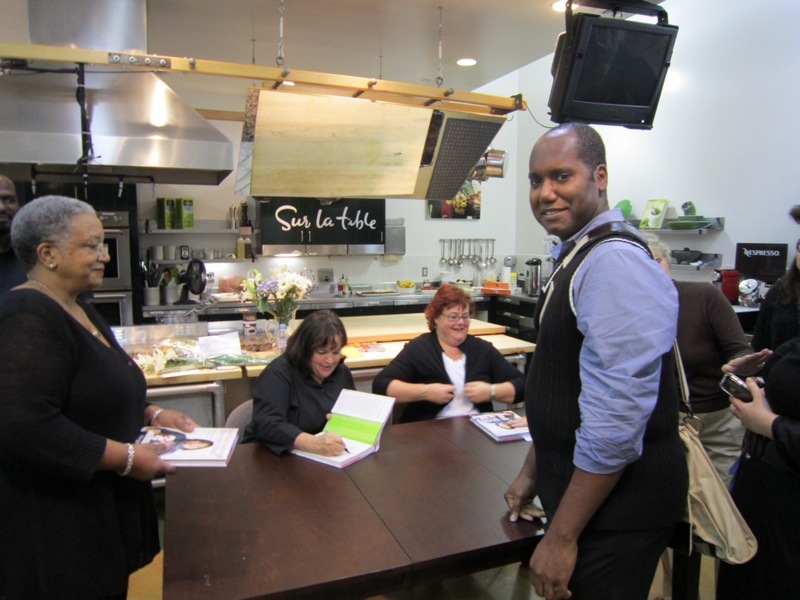 As much as the signing felt like a comedy of errors, trying to make a recipe from her book turned into just as much of one, too. But that’s for Part 2! Next story moving: what, again! ?